High-quality small Air Force flag mounted to a 10" black dowel. All our mini Air Force Flags are proudly made in the USA. 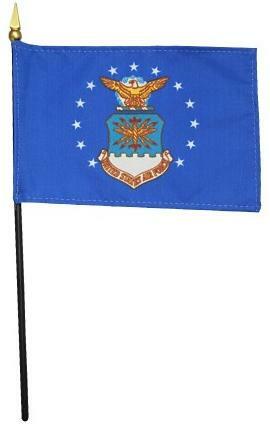 Fourth in ceremonial order, this flag features the Air Force coat of arms on a blue background. It is surrounded by 13 white stars that represent the thirteen original colonies and above the coat of arms is the Air Force crest, a bald eagle whose wings frame three stars to represent the three branches of the National Defense establishment, which are the Army, Air Force and Navy. This flag was approved in 1951 and has not changed since.